How do I prepare for an acupuncture apppointment? Do not arrive hurried or rushed for your treatment. Do not eat a heavy meal before or after your treatment. You are not supposed to feel hungry before acupuncture treatment. A light snack is advised for optimum effect. Do not exert yourself for several hours before and after your treament. Do not take any sour food before or after treatment. Most patients experience no pain. Everyone's tolerance for pain is individual, but with proper breathing techniques those fears can disappear. With long needles, in some areas, there is a risk of organ or blood vessel penetration. However, in his 18 years of practice, Kun Xiang L.Ac., has never had any incident of infection or bleeding. Acupuncture Is Covered by Worker's Compensation And Most Health Plans. Most health insurance is provided as a benefit through employers or employer groups. It is designed to reduce the cost of your health care. A new law, Senate Bill 2179, effective January 1985, requires health care service plans, nonprofit hospital service plans and disability insurance policies to offer acupuncture coverage. Summary of Senate Bill 2179 is as follows: This law requires all insurance companies to offer acupuncture coverage on all group policies. This law also requires all providers of disability insurance to offer acupuncture coverage on all groups policies. It includes every health insurance company, health care service plan and nonprofit hospital service plan and every insurer issuing group disability insurance, which covers hospital, medical or surgical expenses. Health maintenance organizations (like Kaiser and Cigna) and employees of a public entity (state, county, city) are exempted. California Insurance Code #10176 requires coverage of services rendered by certain qualified health professionals who are licensed under California law, when such services would have been paid for if rendered by a physician. Senate Bill 2179 amended this section to include acupuncturists on the list of qualified providers. Therefore, it is illegal for an insurer to offer a health insurance policy in California which expressly covers acupuncture when performed by M.D. 's but not when performed by acupuncturists. Assignments are accepted for benefits from personal injury cases from automobile or other accidents. Employees who are injured during performance of their work, or become ill as a result of their occupation are insured and doctors fees, including acupuncture, are provided. From Department Of Industrial Relations: William L. Clark, M.D. 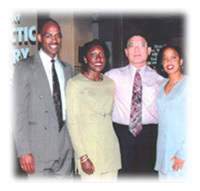 Acting Medical Director, states that acupuncture is a well-recognized medical treatment in appropriate cases. It is not necessary to be on any panel to treat Worker's Compensation Injuries. Acupuncure is also covered under the Federal Felexible Spending Account Program as a health care expense.